These 'Secret Projects' books are really fascinating reads. Though they are not released in order, those interested in what might have been will find a ton of really neat material in each of these editions. This is one of the larger offerings at over 350 pages with a lot of photos, whiffer models, and various illustrations. After WWII the UK was still considered a major force separate from the rest of the world. 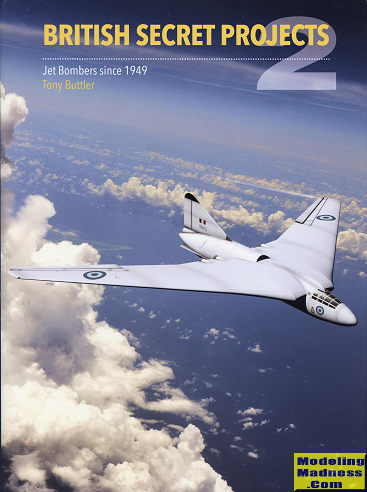 This book is titled Jet Bombers since 1949 and you will find the development of a number of aircraft included. Some of these sections resulted in a complete and operational aircraft. In this category you will find the Canberra, V-bombers, and the Tornado. As you'd expect, it also includes what were later called strike aircraft such as the Jaguar, Harrier, and Buccaneer. There are also projects that made it to the prototype stage but for various reasons, were never proceeded into production. In this group we'd include the Short Sperrin and the darling of the 'those damn politicians' crowd, the TSR.2. Still others were unable to make it past mock up and even more were little more than very interesting paper projects. Some interesting subjects were based on research aircraft, but as is usually the case, these were never able to overcome the technology obstacles of the time to make it into viable weapons systems. Any more, aircraft projects outside the US, Russia and China are usually a consortium of manufacturers from several nations, such is the cost involved in development. One could make the point that the Tornado and Jaguar, for instance, were not solely British projects, but even those were mostly developed in the UK so are valid additions to this volume. The author must have spent considerable time gathering information on each of the various projects, and it shows. The background information is considerable. We can also thank the illustrators used for some superlative line drawings and 'what if' illustrations such as you see on the cover. There are also several models of various types included. Some from the manufacturers and others more recently produced. In all, it makes for a fascinating read of what could have been and how those that made it were developed. A book that will take you a bit to read as there is a lot of information, but one that I know you will find to be a satisfying read. Like all in this series, most highly recommended.